Do you have walkable flat roofing on your mind? When it comes to residential roofing, not many people give it much thought. They don’t realize how important it is to evaluate their options. They don’t think about how their roof can help improve both the appearance and utility of their home. For many homeowners, a roof is simply a way to keep their home dry and protected from the elements. However, the truth is the type of roof you choose can have a big impact on both how you are able to use your home. It also helps determine your home’s value. One of the best options for homeowners looking for a roof that can pull its weight and almost pay for itself is walkable flat roofing. What Makes Walkable Flat Roofing a Great Choice? Walkable flat roofing is a good option because (as its name implies) it is a kind of roof you can walk on, sit on, and even have parties on. Heavy use is the whole point of this roofing’s design. It is a flat surface that does not pose safety hazards to individuals. Its design makes walkable flat roofing a particularly great choice for boathouses. It’s also excellent for balconies above living spaces. Walkable flat roofing can even add to the usable space of your home. It’s perfect for modern balconies you could use for entertaining. 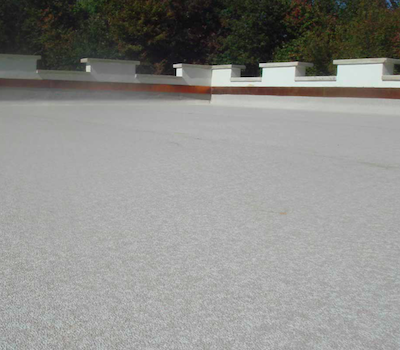 Walkable flat roofing gives you the perfect mix of protection and utility. Are You Interested in Learning More about Walkable Flat Roofing? If you are considering upgrading or replacing your current roof, walkable flat roofing should be on your short list of top options. At Montgomery Contractors, Inc., we can help you find the perfect walkable flat roofing option to suit your needs. Just wait until you see some of the visuals we can share with you from other homeowners who have installed this type of roofing. Ready to see the wonders of walkable flat roofing for yourself? Give us a call at (910)-220-2172 or contact us online today.